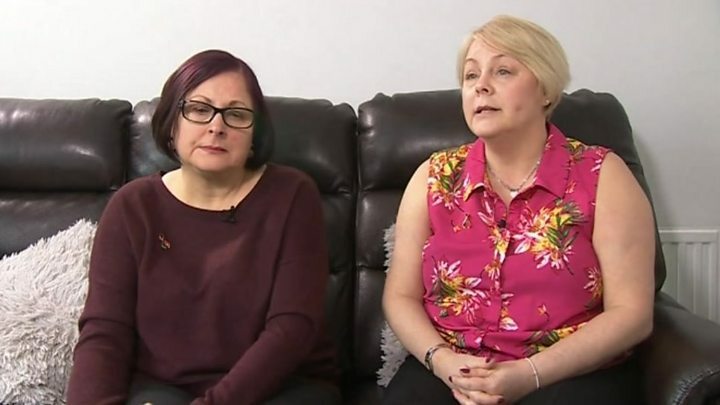 Media captionKaren Blackaby (left) and Kim Pomeroy said a recent rise in knife crime was a "national crisis"
The family of a man who died after he was stabbed on a train have backed a petition calling for tougher jail sentences for knife crime. His sisters Karen Blackaby and Kim Pomeroy said a recent rise in knife crime was a "national crisis". Darren Pencille, 36, of no fixed address, has denied murder and possession of an offensive weapon. He is due to stand trial in June. Chelsea Mitchell, 27, of Willbury Road, Farnham, has pleaded not guilty to assisting an offender. Ms Pomeroy, from Loughton in Essex, said the family was "absolutely heartbroken" at the loss of a "loving father, loving husband, loving son and loving brother". Her brother was stabbed to death on a Guildford to London service, near Horsley in Surrey, on 4 January. "Our family has been destroyed by this," Ms Pomeroy told the BBC. "Speaking on behalf of Lee's wife, Lana, she is now traumatised because her husband went off on a train one day and didn't come back. "If this can happen to a 51-year-old man just going about his business on a train in the middle of the day - this terrifies me, because if it can happen to him it can happen to anybody." Ms Blackaby, from Royston in Hertfordshire, added: "We don't want that for one more person, and it is a crisis, a national crisis at the moment. Enough is enough." The petition calling for longer prison sentences for people convicted of knife crime is due to be debated in Parliament on 25 March.